American School Counseling Association.1998. American School Counseling Association's Position Statement on Character Education. http://www.schoolcounselor.org/conte nt.cfm?L1=1000&L2=7. Diunduh 10 Maret 2017. Battistich,Voctor. 2007. Character Education, Prevention and Poditive Youth Development. Illnois : University Of Missouri. Badan Narkotika Nasional. 2007. 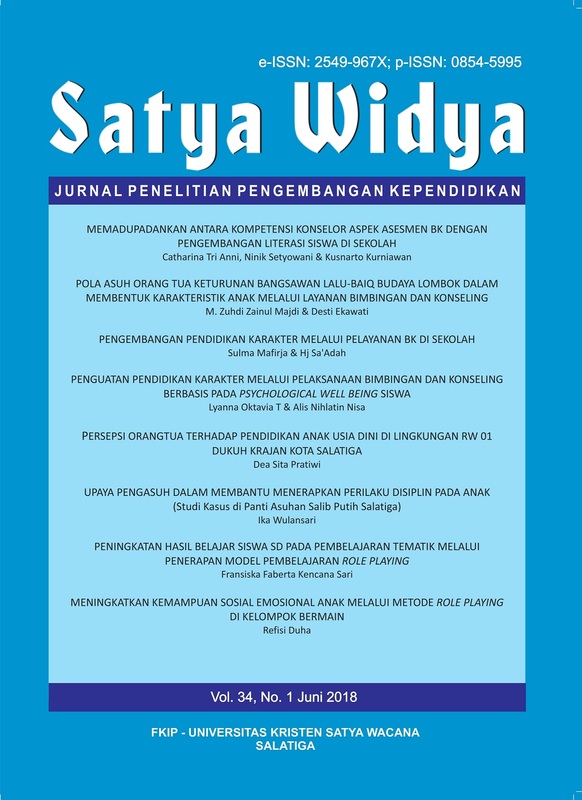 Mengenal Penyalahgunaan Narkoba, Buku 2A untuk remaja / anak muda. BNN: Jakarta. Bradburn, N.M. (1969). The Structure of Psychological Well-Being. 1969. Chicago: Aldine Publishing Company. Perspective on Human Development. London : Sage Publication. Departemen Pendidikan Nasional. (2003). Sistem Pendidikan Nasional. Jakarta: Depdiknas. Dodge, R., Dally, A., Huyton, J., Sanders, L.D. L.W., Knight, T. (2012). Integrating the Hedonic and Eudaimonic Perspecive to More Comprehensively Understand Wellbeing and Pathways to Wellbeing. International Journal of Wellbeing: 2 (3), 196-221. Jackson, R.A. (2007). Aristotle on What I Mean to be Happy. Richmond Journal of Philosophy 16 (Winter 2007: 1-8) Lickona.1991.Educating for Character;How Our School Can Teach Respect and Responsibility.Bantan Books,New York Lickona.2003. CEP`s Eleven Principles of Effecive Character Education. Washington: Character Education Partnership McBrien, J. L., & Brandt, R. S. 1997. The Language of Learning: A Guide to Education Terms. Alexandria, VA: Association for Supervision and Curriculum Development. Musfiroh,Tadkiroatun. 2008. Pengembangan Karakter Anak Melalui Pendidikan Karakter. Tinjauan Beberapa Aspek Character Building. Yogyakarta : Kerjasama Lembaga Penelitian Unversitas Negeri Yogyakarta. Tiara Wacana Ryff, D. 1989. Happiness is everything, or is it? Explorations on the Meaning of Psychological Well-Being. Journal of Personality and Social Psychology, 57. 1069-1081. Ryff, D. & Singer, K. 2006. Know Thyself and Become What You Are: A Eudaimonic Approach to Psychological Well-Being. Journal of Happiness Studies, 9. 13-19. Ryff, D. & Keyes, C. L. 1995. The Structure of Psychological Well-Being Revisited. Journal of Personality and Social Psychology, 69. 719-727 Surya, Mohammad. Kekerasan Di IPDN. http://www.pikiran-rakyat.com/jawabarat/2008/06/12/72845/rektor-ipdnnonaktif-nyoman-sumaryadi-divonisbebas. Diakses tanggal 11Maret 2017. Seligman, M E.P. (2002). Autenthic Happiness. Bandung: Mizan Media Utama. Williams, M., & Schnaps, E. (Eds.) 1999. Character Education: The foundation for teacher Education. Washington, DC: Character Education Partnership. Yusuf, Syamsu. 2007. Psikologi Perkembangan Anak dan Remaja. Bandung : PT. Remaja Rosdakarya.